Award-winning cookbook author and National Press Club favorite Dorie Greenspan is back at the Fourth Estate restaurant for a sumptuous wine dinner on Tuesday, Oct. 23. 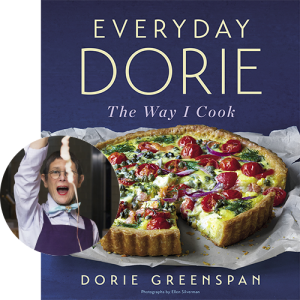 The dinner marks the debut of Greenspan's latest cookbook "Everyday Dorie: The Way I Cook," 368 pages of practical recipes sure to become instant classics. The dinner is the third Club appearance by Greenspan, an inductee of the James Beard Foundation’s Who’s Who of Food and Beverage in America and the author of two James Beard award-winning cookbooks. Her previous appearances have sold out quickly so be sure to secure your tickets early. Purchase tickets online and reserve your spot. The evening begins at 6:30 p.m. with passed hors d’oeuvres. A sit-down dinner paired with appropriate wines follows at 7 p.m. The cost is $95 for individual tickets, with a $10 discount when purchasing two of the "Couples Discount" tickets. NPC members receive an additional 15% discount. You must be logged in to receive the discount. One copy of "Everyday Dorie: The Way I Cook" is included with individual tickets. Couples tickets include one copy of the book.